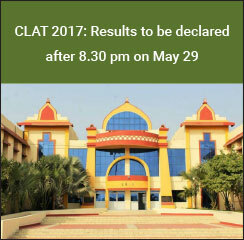 The Common Law Admission Test (CLAT) Results 2017 will be released by the Chanakya National Law University (CNLU) Patna on May 29 after 8.30 pm. This was notified through an official statement released by CNLU Patna on the CLAT website. As per the statement, “The result of CLAT 2017 online examination that took place on 14th May 2017 will be uploaded after 8.30 pm today, the 29th May 2017. The candidates can avail the same from their registered ID”. The CLAT result will contain the candidates’ All India Rank (AIR), State Rank (SR) and Category Rank (CR) besides the overall score obtained by them out of 200. CLAT 2016 was topped by Viraj Ananth of Bengaluru who scored 174.5 marks followed by Vansh Aggarwal from Delhi who bagged AIR 2 with a CLAT score of 172.15 and Ankur Singhal, another Delhite, who bagged AIR 3 with a score of 171.75 in the law exam. While the result of CLAT 2017 is being announced on the same date as scheduled, CLAT aspirants who were eagerly awaiting the declaration since morning will now have to wait a few more hours to know their qualifying status in one of India’s most competitive law exams. Some aspirants may find the wait more testing than usual, especially when compared to last year, when the CLAT 2016 Results were announced one full day in advance by Rajiv Gandhi National University of Law (RGNUL) Patiala. CLAT 2017 was held online on May 14 at 63 exam centres across India. The national level law entrance exam will offer admissions to five-year integrated undergraduate law programmes (BA LLB, B.Com LLB, B.Sc LLB and BBA LLB) and postgraduate law programmes of the 18 National Law Universities and other participating law institutes. The applications for CLAT 2017 had begun from January 1. In an exclusive interview with Careers360, Dr. A. Lakshminath, the CLAT 2017 Convener had revealed that a record 44,565 candidates had applied for the available 2312 UG law seats and 6,111 candidates had applied for the available 604 PG law seats across the NLUs through CLAT 2017. Once CNLU Patna releases the CLAT 2017 Result post 8.30 pm., candidates will be able to check the same via the steps given below. They must enter their registered CLAT 2017 Login ID and Password. A ‘Result’ tab will be displayed which candidates must click on. The candidate’s CLAT 2017 score and rank will appear on screen. The scorecard and result sheet of CLAT 2017 must be downloaded and kept safely until the admissions process of CLAT 2017 is concluded. As per the CLAT 2017 Exam Pattern, candidates were asked 200 Objective MCQs (Multiple Choice Questions) from across five subjects, namely Legal Aptitude, Logical Reasoning, English (including Comprehension), General Knowledge & Current Affairs and Elementary Mathematics (Numerical Ability). The exam was for a duration of two hours, with every right answer being awarded 1 mark and 0.25 marks being deducted for every incorrect one. The provisional CLAT 2017 Answer Key was released by CNLU Patna on May 16 while the final answer key was released on May 25. A number of discrepancies were found in the Answer Key with some questions having more than one right answer and other questions being incorrect. This has led many aspirants to worry about whether CNLU Patna will consider these questions while marking their scores, although the Institute has declared that it will release the CLAT 2017 Result after taking all objections into account. Keep up with the latest news and updates on CLAT only at law.careers360.com!